The Rigaku ZSX Primus 400 is a wavelength dispersive x-ray fluorescence spectrometer designed for rapid elemental analysis of very large and/or heavy objects. With a maximum sample size of 400mm diameter, 50mm thick and weighing up to 30kg, the ZSX Primus 400 is ideally suited to the analysis of sputtering targets, magnetic disks, or for multilayer film metrology or elemental analysis of large items. The ZSX Primus 400 is able to cater for a range of different sample sizes and shapes using optional made to measure adapter inserts. This instrument is tailored to quality control applications with a variable measurement spot of 30 to 0.5mm in diameter, with 5-step automatic selection. It can even check sample uniformity. The option real-time camera allows the user to view the analysis point providing absolute certainty that they are generating data about the correct region. 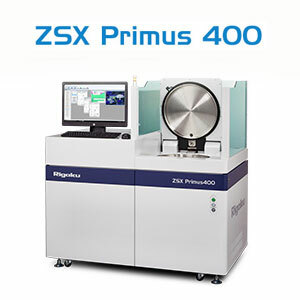 The large sample capable Rigaku ZSX Primus 400 retains the capabilities of a traditional WDXRF instrument. As such it is able to measure elements from Beryllium (BE) through to Uranium (U) with both high resolution and high precision. It is able to cater to all samples types including solids, powders, thin films and liquid. The ZSX Primus 400 can handle compositions from the ppm level and up to tens of percent and thicknesses from sub-angstrom up to millimetres. The ZSX Primus 400 can also be supplied with an optional diffraction peak interference rejection for optimal single crystal substrates. The ZSX Primus 400 complies to SEMI and CE industry standards.